We are updating the impervious cover data used to calculate the drainage charge. Resulting changes to your drainage charge will be reflected on your February City of Austin utility bill. In about 85% of cases, the change is less than $1 per month. Others will have a larger increase or decrease. The Find My Drainage Charge tool has been updated with the new data. Please use this tool to see an estimate of what your drainage charge will be starting in February. The drainage charge is calculated individually for each property, based on the amount and percent of impervious cover. Less impervious cover means a lower charge. Other surfaces that do not absorb rainfall. Impervious cover has a significant impact on stormwater. It increases the amount and speed of stormwater. It also increases the amount of pollutants in stormwater. To find out more about how impervious cover contributes to problems such as flooding, watch the video farther down the page. What is My Impervious Cover? 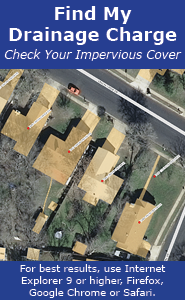 Use the Find My Drainage Charge tool to see the impervious cover on your property. Need help? View this presentation. The Find My Drainage Charge tool works best with Internet Explorer 9 or higher, Firefox, Google Chrome or Safari. If you collect rain water on your property, you may be eligible for a discount on your drainage charge. The discount is available to both residential and commercial properties. However, you must exceed development requirements to be eligible. 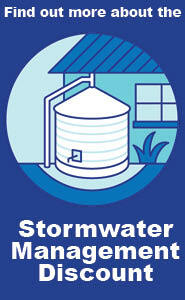 Find out more about the Stormwater Management Discount. If you are planning changes to the impervious cover at your property, you can use this calculator to estimate your drainage charge. Drainage Charge Ordinance or view Austin City Code Chapter 15-2 online.